The pedal desk was developed and constructed by a group of students at UC Davis during a class on sustainable living and was funded by UC Davis's sustainability initiative. It was designed to educate people about energy usage through an interactive use of human power. 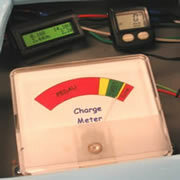 It is safe for public use and has an easy to use touch-less interface that allows the user to power and use a laptop, or any other low power device, entirely off grid by pedal power. The desk will be available for public use at the student commons on campus. The pedal desk design is open source under the Creative Commons License. 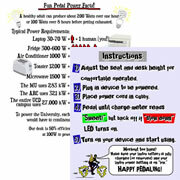 Email us at pedalpower @ ucdavis.edu for information. Check out the Innovate or Die Contest Entry Video! 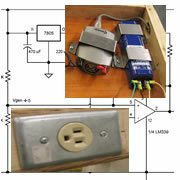 December 18, 2008 - John Welch led a group at Cabrillo College in Santa Cruz in the construction of pedal generator. They made use of our circuit designs and put together a great package (video and photos). November 21, 2008 - Good Day Sacramento features the pedal desk on it's morning news broadcast. Search for "Ju power her laptop" in the video archives. 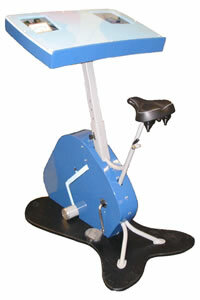 November 13, 2008 - The pedal desk is featured in a UC Davis bicycle quiz. 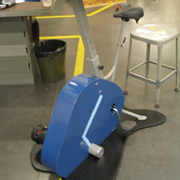 November 13, 2008 - Christian Science Monitor article, Electric Workout, talks about pedal powered gyms including some quotes from pedal desk makers. 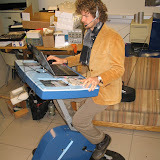 November 1, 2008 - The Pedal Desk is featured in Tamara Dean's new book: The Human Powered Home Choosing Muscles Ove Motors. September 30, 2008 - Re-Nest article. July 11, 2008 - Evolution blog reviews the pedal desk. June 4, 2008 - California Aggie article. The design details are available under the Creative Commons Attribution-Noncommercial 3.0 Unported License. You are free to share and modify the design but it should be for noncommercial use and please link to this web site when sharing. Only some of the design details are available on this website, please email pedalpower @ ucdavis.edu for additional information. Photos: Construction, assembly and use.